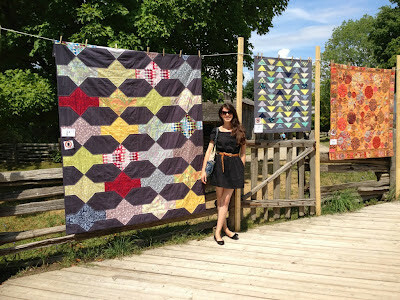 A couple of weeks ago I participated in Quilts at the Creek where I showed two of my quilts. 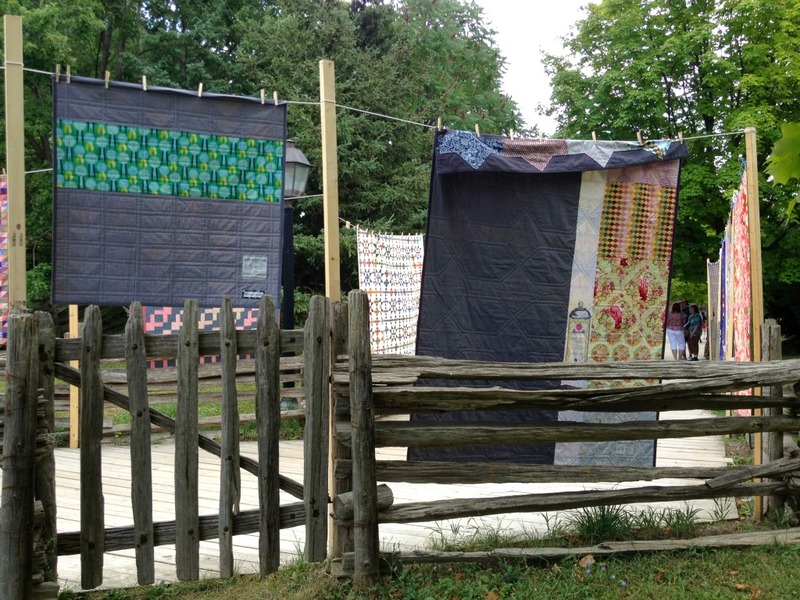 Quilts at the Creek was put on by the York Heritage Quilter's Guild in cooperation with Black Creek Pioneer Village; the YHQG asked my guild (the Toronto Modern Quilt Guild) to participate in the show with them and so I decided to put in two quilts that were finished somewhat recently. Black Creek Pioneer Village is very cool and most of the quilts were hung up outside in various places throughout the village. I've heard a rumour that the show did so well that Black Creek has already decided they want to do the show again next year. Both my mum and Sheila drove into Toronto and the three of us spent the day at the show together; we walked around and visited all of the quilts, went into most of the buildings, watched a weaving demonstration (I recently found out that we somehow missed a hand quilting demonstration), and went to the fabric marketplace about five times as well as the actual giftshop. Before we get into a few pictures, can I just say that I'm a complete moron and didn't actually take pictures of any of the quilts. The only reason I have any pictures of my own quilts in the show is because Sheila and my mum both took pictures of them. Yep, I totally rock. This photo was taken by Sheila (using my phone) and that's me standing in between my two quilts. The one on the right is The Geese Have Landed which has been shown on this blog before, however the one of the left is Mineshaft which I haven't shared. Mineshaft has actually been done for a little while now, but is one that I'm currently writing a pattern for (hopefully it will be done and for sale very soon). I originally intended to put another quilt into the show but it didn't fit the width dimensions that they wanted as it's destined to be a wall hanging. And yes, both of those quilts contain a whole heck of a lot of Tula Pink - you know I love her! 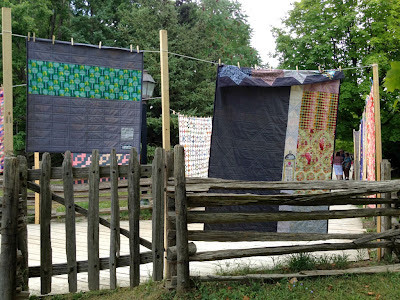 A little anecdote: When I originally ventured out to find my quilts at the show I was dismayed to find that Mineshaft had been hung sideways - as in with the long side across the clothesline (despite the fact that the quilt back is pieced and that it has TWO labels on it that). Luckily a staff member wondered by as I was saying all of this to my mum and got it fixed! I wish they hadn't folded the top over like that (especially since it's crooked which you can really see in the next picture). These are the backs of my quilts! You'll see better pictures of the Mineshaft back when I release the pattern but I must say that I love it! This is where I was standing taking pictures (not this picture obviously) when I heard two older women dissing my Mineshaft quilt - not cool!! Needless to say I didn't go near my quilts again for the rest of the day. Here are a couple of goodies that I picked up both at the Marketplace and in the gift shop. The six fat quarters on the side (as well as a Moda scrap bag that isn't in the picture) are from Log Cabin Yardage which is a Canadian online shop. 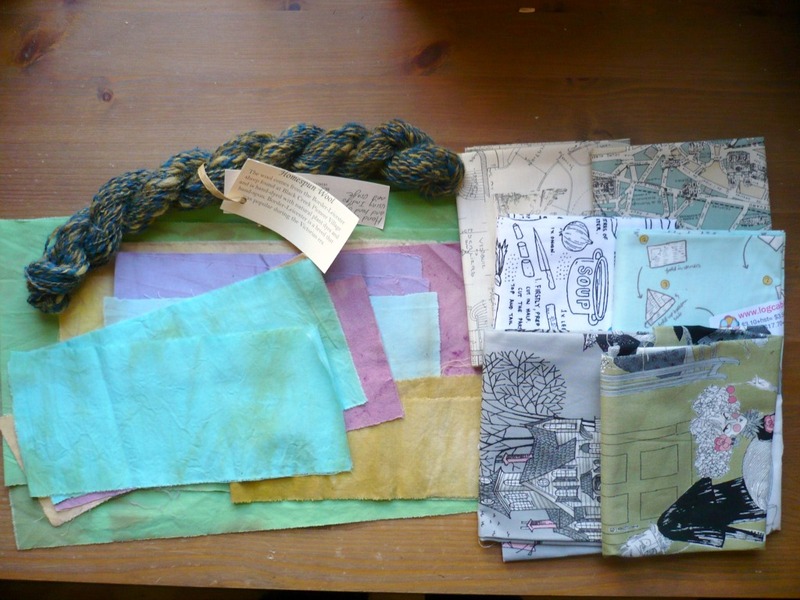 The hand dyed fabric pieces are from Good Lines Decor - they were made using pre-loved cotton and dyed with vegetable dyes - I think the colours are seriously awesome! The yarn is from the gift shop at Black Creek - it was hand spun at the village using wool from their Border-Leicester's (who I saw - cute sheep!) and hand dyed using indigo and osage. The little tag on it even has the name of the girl who made - her name is Kelly. I also bought a set of handmade leather buttons in the gift shop but they're not in the picture either. 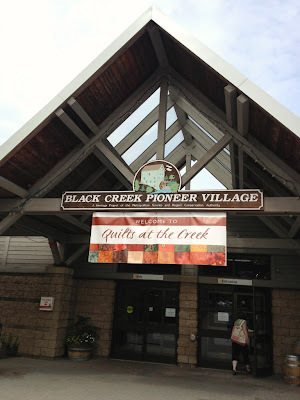 I definitely think that I'll do Quilts at the Creek again and next year, I promise, I'll actually take pictures of the quilts! Sorry you had to overhear the dark side of feedback. It's incredible how different people's viewpoints are on quilting. I think your two pieces are fabulous (loving those Tula prints)...I'm especially fond of those geese!